According to scientists from Duke University, North Carolina, USA, the seabed is about to experience industrial scale mining for mineral deposits and rare earth metals. These are required in the production of things like PCs, smartphones, etc – but the extraction is set to be on a scale which could transform the environment for generations to come. Giant underwater cutters and robotic submarines would be involved in what is essentially strip-mining, where vast areas of the ocean bed are removed and brought to the surface as slurry. The valuable minerals are then siphoned out, and the ‘waste’ – which may contain a variety of toxins and heavy metals from processing – are dumped back into the water. 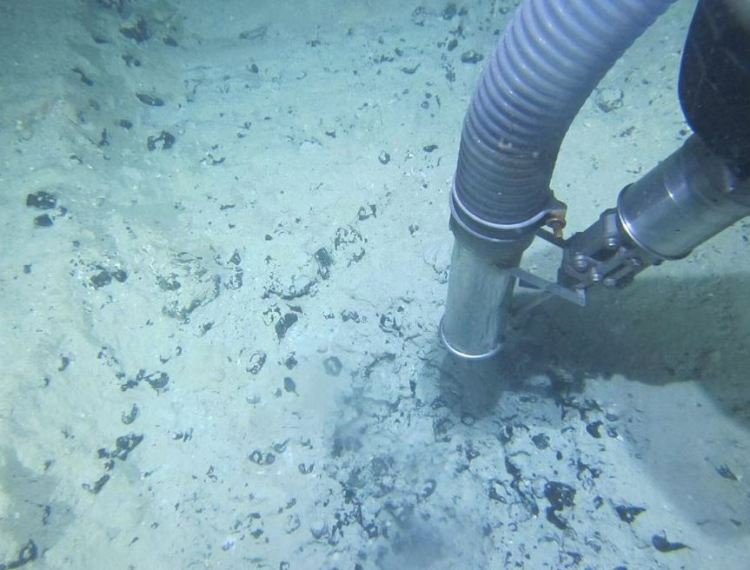 Another equally destructive method, vacuum mining, involves the seabed being sucked up by machines and similarly dealt with. Scientists from Duke told the annual general meeting of the American Association for the Advancement of Science that these processes have the potential to irrevocably destroy the seabed, along with the unique wildlife it supports. Sensitive species will be smothered by sediment and noise will have a detrimental impact on whales and other marine life, Meanwhile, fishing communities could suffer the loss of their livelihood. There is great concern that rapidly dwindling resources may impact on our increasingly unsustainable economic system. But nonetheless, already some 19 leases have been granted over international waters for prospecting of this type – with more pending. Hearteningly, however, there are some signs that sanity might prevail. As an example, Namibia’s National Marine information and Research Centre has expressed such concern over the cumulative effects of seabed mining that its country’s government has imposed a moratorium until further assessments can be made about the long-term effects of these activities. This has, thankfully, halted at least one mining company’s plans to remove between 1 and 5 metres of depth of silt, so as to extract the phosphate deposits therein, before dumping the waste slurry back into the sea. The Research Centre insists – and it’s hard to disagree – that long-term research is needed on the impact on fish stocks and the health of the sea-bed ecology, before more of this damaging activity is undertaken. The team adds that there is at present no real understanding or experience of this type of mining. Surely, enough is enough: at the rate we’re going, we continue to pursue unrealistic long-term material aspirations from which only a minority of the world’s population can benefit to any real extent. It can’t be long before the inevitable decline of our short-lived industrialised ‘civilisation’. In 2012, the United Nations’ report Global Environmental Outlook concluded that growing economies are pushing environmental systems to destabilising extremes. there has been massive species decline through habitat loss, climate change and other manmade factors. All of this is taking place in the name of a highly blinkered vision of ‘human progress’. Economists and politicians are fond of proclaiming that current systems have lifted billions out of poverty over the last 150 years– and that the human race has, so to speak, ‘never had it so good’. But the fact remains, however, that the number of hungry people has risen in recent years to more than 1 billion. Further, 1.4 billion people live on less than $1,25 a day, and 2.5 billion don’t even have the most basic sanitation. When you consider that at the end of the 18th Century, the world was burdened with barely a billion humans – and far from all of them in poverty – it’s hard not to argue that any ‘progress’ on this front is illusory. Can we really claim progress when a billion souls die prematurely from starvation and many hundreds of millions of the world’s population are also dying before their time or being kept alive through reliance on increasingly over-stretched health and welfare systems from diseases associated with over-eating and obesity? A new report by the World Health Organisation recently warned that a ‘deadly’ epidemic combining physical inactivity with diets high in fats, salts and sugars has led to obesity becoming the ‘new normal throughout Europe. Officials said, ahead of an EU Summit in Greece, that up to 27 per cent of Europe’s 13-year-olds and 33 per cent of 11-year-olds are overweight – and the US has yet a worse record, with a new generation of sedentary, unhealthy youngsters growing up. Ah well – but that’s ‘progress’. The contest over the future of the ocean continues to make waves following the announcement this week by an Israel-based diamond mining company, that it plans to start mining marine phosphates near Lüderitz by 2018. In response to the announcement by the Lev Leviev Group this week, local environmental lobby group, Swakopmund Matters, warned about the risks of disrupting the seabed through phosphate mining. They issued a statement saying the 18-month moratorium on all marine phosphate mining activity, which was imposed in September 2013 will be in effect for three years, to allow researchers time to study the likely impact of the proposed marine mine. Erez Mishal, vice president of operations and business development at LGC, told Reuters this week that LGC plans to open a demonstration processing plant at Lüderitz later in the year with the aim of going into full production by 2017 or 2018. “The Leviev Group (LGC) does not have any clearance yet for any activity or construction. Only when the moratorium has ended and the Namibian Government in its own right and on its own terms may have concluded that such mining would be allowed and under what conditions, would LGC be able to present an application for such clearance”, Swakopmund Matters wrote in response. LGC is active in gold and diamond mining, owns a cutting and polishing factory in Namibia, and previously participated in diamond mining offshore Namibia, in partnership with De Beers. It is understood that the Leviev Group (LGC) intends to start mining in the vicinity of Lüderitz by 2018. LGC intends to mine in water-depths of some 300 metres and estimates that its license area contains some 2 billion tonnes of phosphate. LGC is owned by diamond baron Mr Lev Leviev, the controlling shareholder of Africa-Israel Investments. The phosphate project is being developed by LGC’s local subsidiary, LL Namibia Phosphates. Leviev has been in the news over his alleged involvement in the construction of illegal settlements in the occupied West Bank o Palestine. Following recent public protests outside Leviev’s jewellery store in London, Oxfam Charity distanced itself from Leviev and denied they had accepted any donations from him. UNICEF said there are “at least reasonable grounds for suspecting” that Leviev companies were building settlements in the occupied West Bank and therefore refused to partner with Leviev, or accept contributions. Nautilus Minerals is engaged in the undersea exploration and mining of gold, silver, copper and zinc in Australasia. The company is headquartered in Toronto, Ontario, Canada, and has overseas offices in Milton Queensland, Australia, Port Moresby, Papua New Guinea and Nuku’alofa, Tonga. Operates the largest ocean floor mining operation. Has secured exploration licenses from Fiji, Tonga, Solomon Islands, New Guinea and Vanuatu. The company recently filed for an exploration license from New Zealand. Strong financials with 53,954,109 in cash and cash equivalents, $288,400,894 in total assets and only $41,524,699 in total liabilities as of September 2013. No source of income from mining operations. Filed lawsuit against Papua, New Guinea for failing to abide by the State Equity Option Agreement signed in March 2011. Must comply with foreign environmental sea floor drilling and mining regulations. Local environmental groups oppose ocean floor mining. Foreign governments may revoke exploration permits. Nautilus may run out of cash before finding an ore mineral deposit. High risk of accident, injury or death to mining personnel. Strong competition from large-cap companies like BP Petroleum that conduct ocean floor mining activities. Nautilus Minerals has focused its resources on the Solwara 1 Project, a gold and copper exploration endeavor off the coast of Papua New Guinea. To facilitate the project, the company has technical agreements with Soil Machine Dynamics, Ocean Floor Geophysics and GE Oil & Gas to purchase and operate production equipment and vessels. 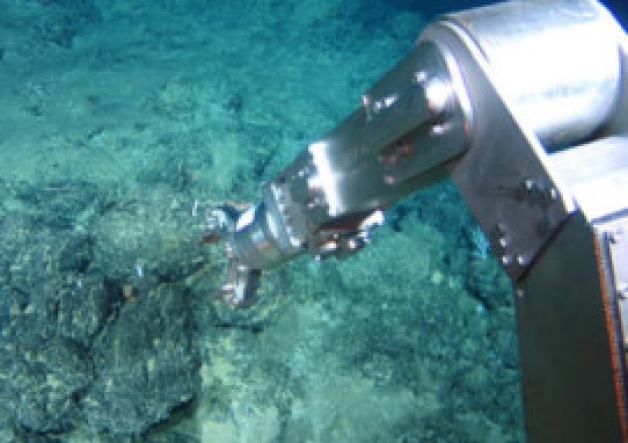 Robotic mining equipment will drill on the sea floor and extract the raw ore. It is then transported directly to the awaiting ships on the surface for processing. On Feb. 14, 2014, Nautilus Minerals terminated the State Equity Option Agreement with the New Guinea government for not completing a 30% purchase interest in the Solwara 1 Project. Nautilus Minerals has claimed damages from the termination and is pursuing a resolution with the government. As of September 2013, Nautilus Minerals has a market cap of $88.15 million and has 433,897,865 common shares outstanding. Nautilus Minerals has three significant shareholders that own more than 50% of the company’s stock. Mawarid Mining LLC owns 28%, Metalloinvest Holding (Cyprus) Limited owns 20.75% and Anglo American Plc owns 5.95% of the common shares. The Cook Islands expects a mining boom if government plans are approved by the international body that governs deep-sea mining. But one NGO has warned about the potential consequences. The Pacific island nation of 15 small islands has economic rights spanning 1.83 million square kilometres of ocean. In waters north of the islands are massive fields of polymetallic nodules, also called manganese nodules. The nodules are made up of manganese and iron oxides as well as cobalt, copper and nickel, making them a valuable economic commodity. Last December, the state-owned Cook Islands Investment Corporation (CIIC) submitted an application to explore for polymetallic nodules to the International Seabed Authority (ISA), a UN-created body based in Jamaica. The CIIC then presented its application to the ISA last month and the decision is due to be announced in July, all according to ISA standard timelines. If the application is successful, the Cook Islands will become the fourth Pacific island nation after Kiribati, Nauru and Tonga to have an ISA-sponsored contract. But concerns are growing about the risks to the marine environment and the island’s vital fishing industry from prospecting for the nodules, which can take anything from decades to millions of years to regrow. “Governments and industry players argue for the perceived economic benefits from the exploitation of minerals on the seabed. But the Cook Islands is heavily dependent on fisheries as a key economic sector and as a major source of livelihood and food for coastal communities. 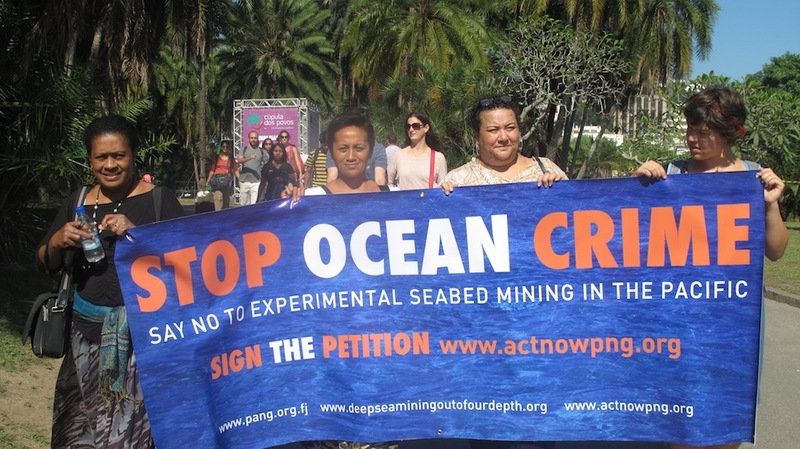 There are no scientific studies to indicate how this strip mining of the seabed for minerals will affect the fishing industry, which generates annual revenues estimated at up to US$1 billion, as well as the livelihood of the majority of our coastal communities,” warns Maureen Penjueli, coordinator of the Pacific Network on Globalisation, a regional NGO that promotes ‘economic justice’ on trade issues. 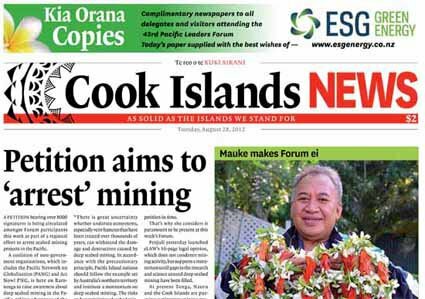 According to Cook Island authorities, the value of the seabed minerals in the targeted 75,000 square kilometre reserve site is estimated at US$227 billion. The site will be explored by the CIIC on a joint arrangement with G-TEC Sea Mineral Resources of Belgium. Richard Neves, financial secretary of the Cook Islands Ministry of Finance and Economic Management, contends that deep-sea mining activities will have little impact on the fishing industry. “These activities, as I understand them, will concentrate only on certain parts of the seabed,” Neves tells SciDev.Net. “Additionally, we are just scooping nodules off the bottom of the sea, not chopping up crusts. The Cook Islands government says it will also look closely at the licensing of seabed minerals in the next five years to ensure policies comply with international standards and practices. A revised version of the Seabed Minerals Act has been submitted for approval by the Seabed Minerals Authority, according to seabed minerals commissioner Paul Lynch. The results of the Seabed Minerals Exploratory Licensing review are due to be announced in June. Despite the claims from John Momis, the ABG, their AusAID backers and the Rio Tinto cheer squad led by New Dawn (see below), Bougainville women have effectively blocked the Panguna mine from reopening with a set of conditions that can never be met by the mine’s owners. BOUGAINVILLE WOMEN WANT PANGUNA RE-OPENED. The two-days Special Bougainville Women’s Forum on Mining that ended in Buka yesterday fully recommended that the closed Panguna copper and gold mine must be opened to help ABG meet the number three pillar of the Bougainville Peace Agreement that is economic self reliance. In the final recommendations made in Districts by Districts, the women also recommended that outstanding issues must be addressed before the mine is re-opened. From recommendations made by the women of South Bougainville, they recommended that the mine must support the overall goal by the people to gain independence and said that Independence with no Economy would be only a dream. The women of Central Bougainville divided in two, the women of Panguna/Torau and Panguna called for the grievances for the landowners must be met first and that included allocation of land for their resettlement before the mine is opened. And the women of Wakunai agreed to resettle the Panguna landowners at Kurwina Plantation and supported the re-opening to create employment for Bougainvilleans as priority. The women of Atolls, and Tinputz fully supported the re-opening questioning who will compensate for the death of the people of North Bougainville who fell depending Panguna. And the women of Kunua/Kereaka wanted the re-opening of Panguna but wanted the ABG to own the company one hundred percent so that the people of Bougainville can truly benefit from the operation. Nearly all women did not want the moratorium to be lifted and recommended only one mine should be allowed to operate and quickly invest in Tourism and Agriculture. The two-days Special Bougainville Women’s Forum on Mining was broadcasted live on New Dawn FM. Lihir Mine will resume operation. Officer in Charge of the Mineral Resources Authority (MRA), Nathan Mosusu announced the resumption of operations at the Lihir Gold Mine early this week following the closure of mining operations on 21 March 2014. The mine ceased operations following the placement of gorgors on mine facilities by Landolam Pit Landowners over a dispute related to the benefits provided under the Lihir Integrated Benefits Package provided by Newcrest Mining Limited – the owner and operator of the Lihir Gold Mine and managed by the Lihir Mine Area Landowners Association (LMALA). Following the closure, the National Government Team led by MRA and accompanied by officers from the State Solicitor’s Office, held discussions with the disputing landowners to request the removal of gorgors and reach an understanding on a way forward to deal with the disputes. During the discussions, landowners removed the gorgors which allowed the mine to re-commence operation early this week. Mr Mosusu commended the disputing parties for their cooperation in reaching an understanding and continuing the dialogue on the way forward to deal with their disputes. 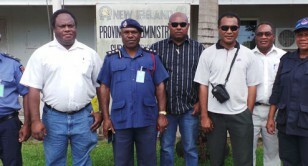 Mr Mosusu also heaped praise on Chief Superintendent Anton Billy – ACP New Guinea Islands Region, Senior Inspector Elisa Taksir – PPC New Ireland and Inspector Julie Palakai, Lihir Police Station Commander who rapidly deployed additional police manpower on the island to ensure mine operations resumed without further disruptions. The OIC said the police’s tireless efforts in supporting the National Government team facilitate understanding between the disputing parties and providing a safe and secure environment for discussions to take place must be commended. He further urged the Lihir Gold Mine landowners to cooperate and continue the dialogue towards reaching a satisfactory outcome that would be of common benefit to all Lihirians affected by the mine. Mr Mosusu said placing gorgors on the Lihir mine which could potentially affect the benefits to Lihirians, New Irelanders and PNG as a whole.